We believe that the mission of Habitat for Humanity to provide simple, decent, and affordable housing for the public is one of the most important missions an architect and citizen of the world can embrace. Southern Louisiana provides a rich cultural and climatic canvas in which to complete this mission because of the deep sense of community reliant on cultural identity. Thusly, this strong rooted community identified universally as unique requires a specific and regionally relevant response to the ‘Habitat for Humanity’ mission. 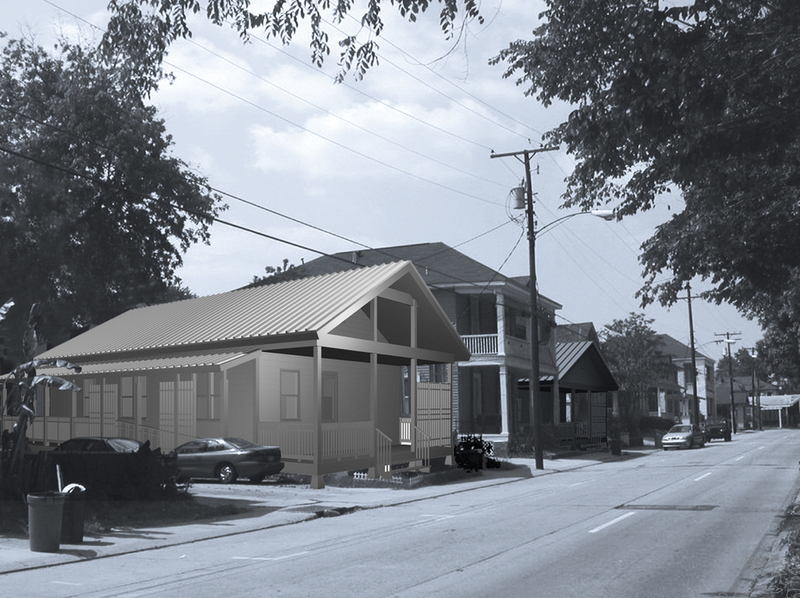 Because of this important relationship in Southern Louisiana between culture, community, and climate, we believe that the notion of sustainability is of utmost importance in the built environment. It is imperative that the architect work to sustain the culture as well as the environment. We must be vigilant in our pursuit to understand the principles that led to such an identifiable and vibrant relationship between culture, community, and climate. We must be vigilant to understand that no culture is stagnant. The shotgun housing type provides us with a clear built example of the connection between these relationships. We start with the traditional, delineating its relevant cultural and climatic components and then use these principles to address contemporary concerns. The HHsg house is the resultant of this analysis. It provides a ‘simple, decent, and affordable’ home and establishes pride of place by sustaining the local culture, climate and community. The cultural sustainability of the HHsg starts with a clear architectural diagram of the range from community to private space. The living and dining room are next in the range from public to private, with the kitchen at the back, adjacent to the back porch. The front porch is a space that is a cultural necessity. It allows the inhabitants to communicate with the street and define their individuality within the greater community. It is the place where stories are told, public information is exchanged, and unique personal flair is established. It is the public face of the house. It must have integrity and be a PLACE to be, not just a front door or small covered area. The extension of the gable creates the porch and draws the house towards the street. It gives space to the façade extending the space within the house into the community. The porch is not a privilege; it is a necessity if one is to live with a sense of pride, both civic and personal, in the American South. Since one is invited into the kitchen, it acts as a semi-private space. It is a private room for the family where guests are received; similar to the occupancy of its adjacent back porch. Lying immediately adjacent to the interior public spaces, are the HHsg private spaces. They are banded together, clearly dividing the house into public and private zones. They are not separated by a hallway, which wastes space, but by the strong spatial line created by the central bearing wall.